Freshman Charlie McAvoy (photo) and 2016 recruits Kieffer Bellows, Clayton Keller and Chad Krys have been named to the 42-man roster for the 2015 All-American Prospects game in Buffalo. 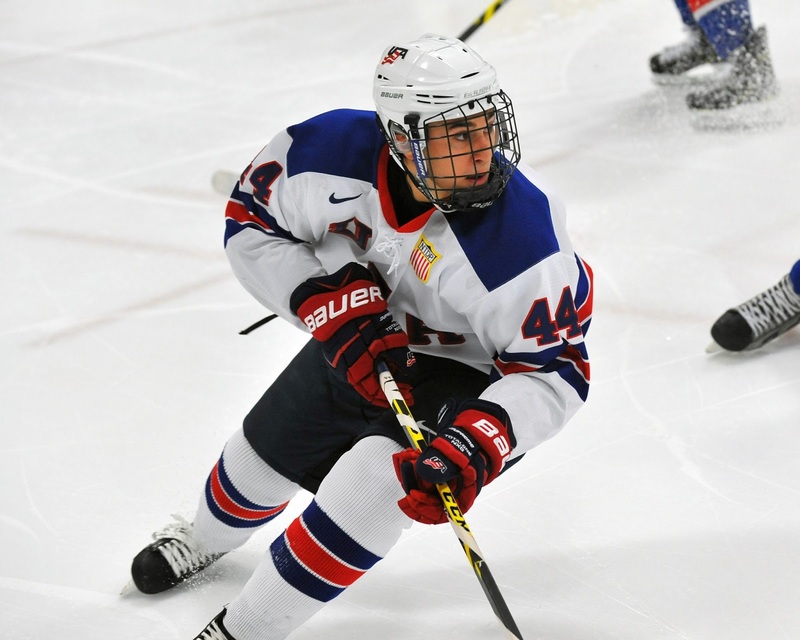 Set for Sept. 24, the game showcases top Americans who are eligible for the 2016 NHL entry draft. All four have been projected as first-round draft picks in next June's draft by multiple ranking services, including Future Considerations, Draft Buzz and The Scout.ca's Sean Lafortune. The three 2016 recruits will skate for the NTDP U18s this season. 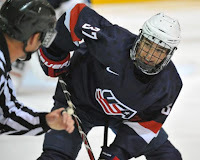 Keller (photo) and Krys were, respectively, the top scoring forward and blueliner last season on the U17s. Bellows played for USHL Sioux Falls, earning Rookie of the Year honors and helping the Stampede win the Clark Cup championship. 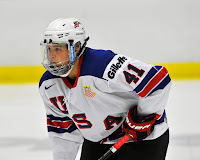 During the IIHF World U18 championships, McAvoy and Krys comprised the top defensive pairing for gold-medal-winning team USA. At last year’s AA Prospects game, which aired on the NHL Network, Jack Eichel and current freshman Jordan Greenway were standouts. Eichel earned player of the game honors and would go on to win the 2015 Hobey Baker Award. ►Krys, who committed to BU earlier this month, is featured in the September 2015 digital edition of New England Hockey Journal. BU has announced starting times for the games on its 2015-16 schedule, which includes seven home games beginning at 4:00 p.m. The move to have some Saturday games begin earlier came in response to receiving positive feedback to 4 p.m. starts at Agganis Arena. The Terriers play an exhibition game against Acadia on Oct. 3 (4 p.m.) before opening on the road against Union College on Oct. 10. The home opener, against Wisconsin, is a week later, Oct. 17, with puck drop at 7 p.m.
With BU’s Oct. 3 exhibition game against Acadia less than six weeks away, it’s a good time to look back on the Terriers’ 2014-15 campaign that resulted in the 30th Beanpot Championship in program history, the eighth Hockey East Tournament title, our third Hobey Baker Award winner and an NCAA playoff run that reached the title game. Start with Boston University: The Season—Full Length Documentary. And then check out individual game highlights found here. ►Causewaycrowd.com, examining top Bruins prospects, profiled 2015 second-round pick (#45 overall) Jakob Forsbacka-Karlsson. With two centers from last year’s Terriers having departed, the Stockholm native, who scored 53 points in 50 games last season for USHL Omaha, is likely to step into a top-six role from the get-go. NTDP U18 defenseman Chad Krys, the latest addition to that recruiting pipeline, discussed his decision to play for the school where both parents were star athletes, his return to the NTDP and trying out for the Junior National Team in Lake Placid. Krys and fellow BU recruits Clayton Keller, Kieffer Bellows and Jake Oettinger will skate against the Terriers in an exhibition game on Friday, Oct. 16. 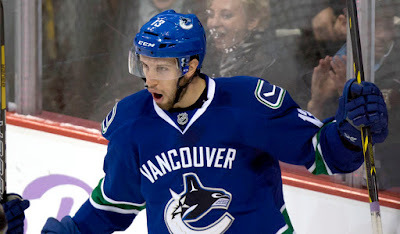 Connecticut native Nick Bonino, acquired by the Penguins this summer, along with former Terrier Adam Clendening, returned to the Nutmeg state for an exhibition game on the rink where he created headlines a decade ago. Goalie Grant Rollheiser, a member of the 2009 NCAA champion Terriers, has signed a new contract with the ECHL Wichita Thunder. Rollheiser was a sixth round draft pick by Toronto in the 2008 draft. Sharks Fan site Blades of Teal reviews Matt Nieto's second NHL season. Sophomore Victoria Bach scored Team Canada’s only goal in a 2-1 overtime loss to Team USA in the 2015 Under 22 Series at Lake Placid. Senior Sarah Lefort and sophomore Rebecca Leslie also skated for Canada. Bach was Hockey East Rookie of the Year last season.